Click on a thumbnail for a closer view. Hit the Back button on your browser or Alt-Left Arrow to return to the Gallery. Close-up views may require short waits on dial-up connections. Cascades of Northern Oregon 24" x 52" poster depicting the Cascade Mountains through the northern half of Oregon with all named peaks and major landforms labeled. 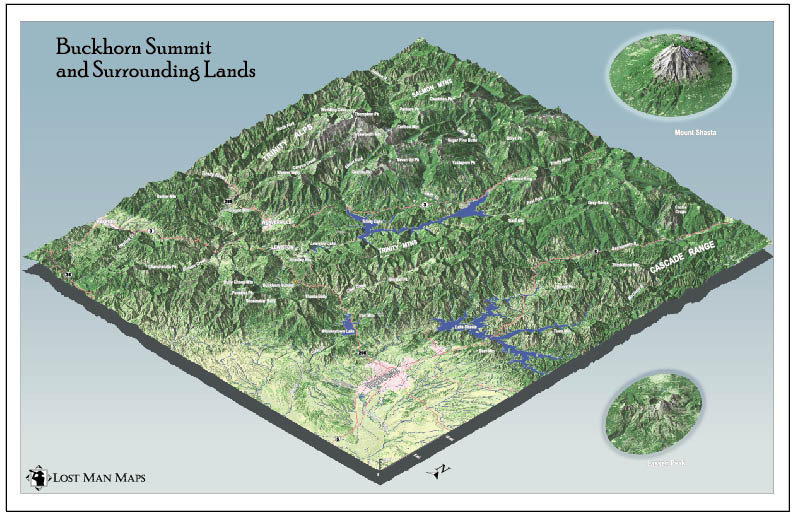 Buckhorn Summit & Surrounding Lands 3-D terrain map of the mountains of Northern California near Redding. Printed at 11"x17". View entire map or Trinity Alps detail. Alpine Areas of Colorado-3D version 3-D terrain map of Colorado clearly showing areas above treeline. Different color schemes for alpine and subalpine areas. Available as 11"x17" print. View entire map or Rocky Mountain National Park detail. 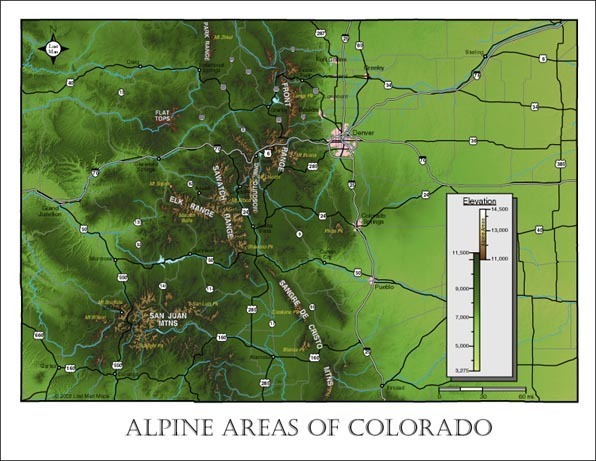 Alpine Areas of Colorado-2D version Shaded relief map of Colorado clearly showing areas above treeline. Different color schemes for alpine and subalpine areas. Available as 8.5"x11" print. View entire map or detail. Mount Hood Southside Climbing Route Rough draft showing the ascent and descent routes used on a climb on Mount Hood. Kings Mountain Aerial perspective view of Kings Mountain, Oregon, showing hiking route to the summit. Located between Portland and Tillamook, Kings Mountain is one of the tallest mountains in the Oregon Coast Range. Available as 8.5"x11" print. 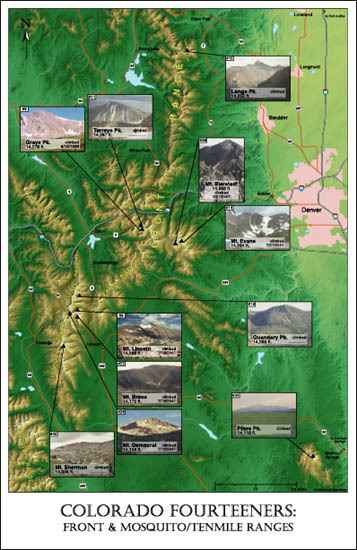 Colorado Fourteeners: Front and Mosquito/Tenmile Ranges Map showing the 6 Fourteeners of the Front Range and the 5 in the Mosquito/Tenmile Range. Entry for each mountain includes photo, elevation, and elevation rank in the state. Available as 11"x17" print. Washington Precipitation 1996 Isoline map showing annual rainfall for the state of Washington in 1996. Flooding in Villa Grove, Illinois Map showing the extent of the estimated 10-year flood in Villa Grove, Illinois, under two different floodplain management scenarios. For information on obtaining prints of any of the above, please contact us. All images and information Copyright © 2003-2007 by Lost Man Maps/Matthew Hoffman. All rights reserved.